We have had some adventures. The inaugural Sorenson family reunion took place over the 4th of July week. 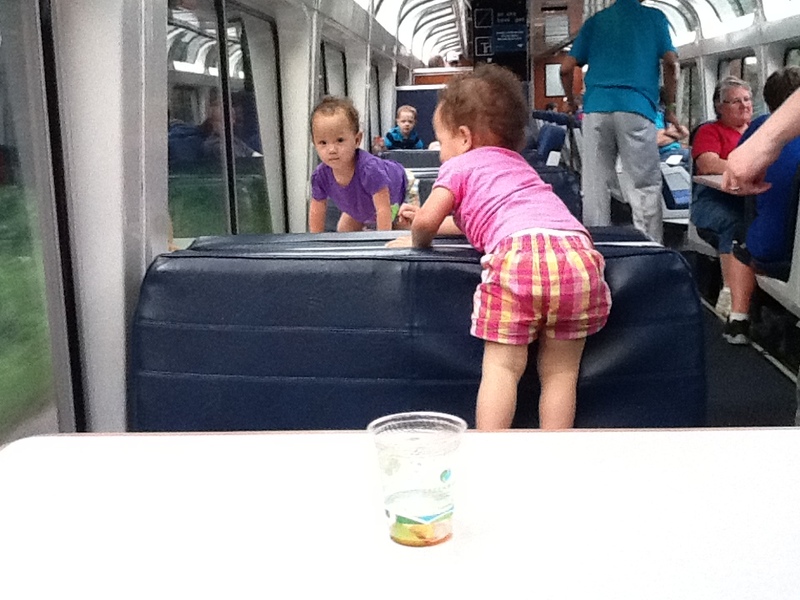 I wanted to try Amtrak to get to Illinois, but Lala was understandably intimidated by the prospect of an overnight train trip with two toddlers. We ended up splitting the difference by taking the train out and coming back to DC by plane. 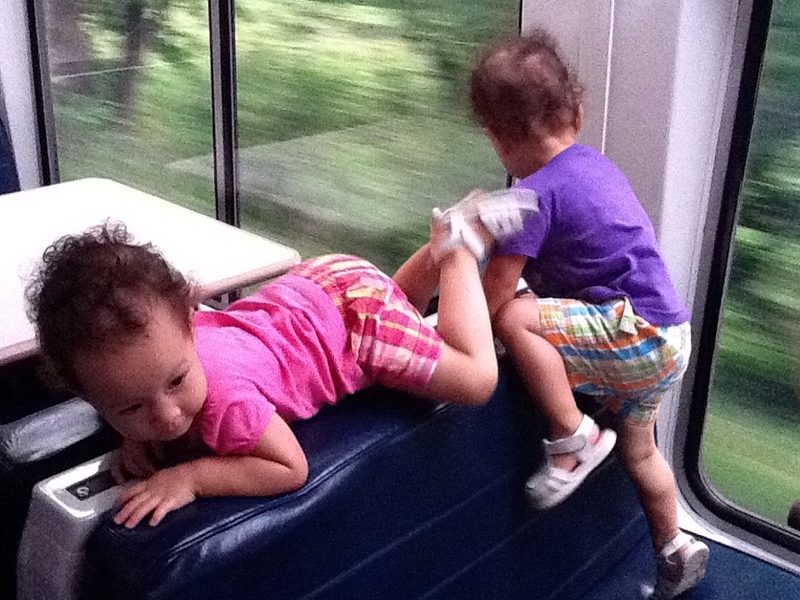 The kids had huge fun climbing and playing in the observation car and in our little room as we went down the track. We even had an audience. Looks like my girls know when to behave after all. We got a roommette, which allowed us to lie down on bunks, each with a kid. I took the top with Rianne. Mikelle on the bottom bunk was so distracted by the lights she could see (and lightning of the storm we were driving through) that she didn't go down until she absolutely couldn't keep herself awake any longer after 10 PM. Both of us had a bit of difficulty sleeping with the kids moving and kicking us, plus the fact that I couldn't leave Rianne to make any bathroom trip. So, the trip was an adventure, but one that did leave us sleep-deprived. 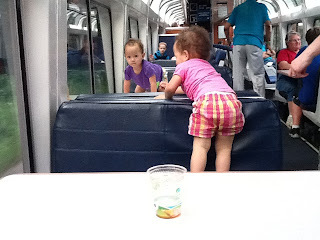 We played with the kids quite a bit in the morning, but they melted down for the last few minutes into Chicago. Lala was pretty ready to get to the house! We found out later that the storm we were going through caused many days of power outages in the DC area. It also blocked the other westbound Amtrak train that was in West Virginia that night - for 20 hours! 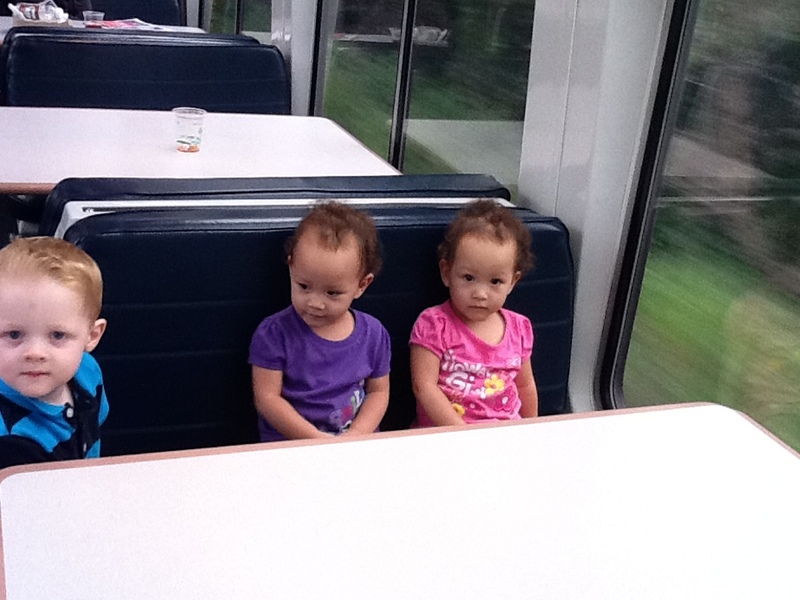 On Friday the 6th we took Amtrak up to Milwaukee. I had never seen the city (that I remembered) and I wanted to do a memorable outing while we were on our vacation. So while there we saw the Milwaukee Public Museum, took a city history and architecture cruise, and went to the Summer Fest music festival. We were so tired that night! We went back to Naperville the next morning. We celebrated our girls' 2nd birthday when we got back from our Milwaukee trip. Jenny made some yummy chocolate cupcakes for them and it was fun to sing their birthday song with everybody. They sure loved their Elmo balloons they got from Grandma. We sure love these birthday girls!! We wanted to extend our stay beyond a week, but I couldn't take off that much work. Fortunately, my company has an office in Aurora. So for the second week of our trip I went to work. I biked to the train station, went one stop, and walked or biked to the office. I got to meet with colleagues there while Lala took another trip to Indiana (Amtrak again) to visit Mayet, her friend from college. My parents said it wasn't a big deal to watch our girls for those few days while I was at work, so it seemed like everyone came out ahead from that plan! Lala was so happy to talk to her friend, who is about to have a baby in September. 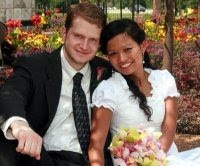 She as well enjoyed visiting and eating filipino food with other filipinos who came to visit Mayet while she was there. Lala enjoyed making some cloth diapers for Mayet. This entry was posted on Sunday, July 22, 2012 and is filed under . You can follow any responses to this entry through the RSS 2.0 feed. You can leave a response, or trackback from your own site.